30 posts categorized "Energy Providers"
The second-largest natural gas producer in West Virginia will pay $53.5 million to settle a lawsuit that alleged the company was cheating thousands of state residents and businesses by shorting them on gas royalty payments, according to terms of the deal unsealed in court this week. Pittsburgh-based EQT Corp. agreed to pay the money to end a federal class-action lawsuit, brought on behalf of about 9,000 people, which alleged that EQT wrongly deducted a variety of unacceptable charges from peoples’ royalty checks. The deal is the latest in a series of settlements in cases that accused natural gas companies of engaging in such maneuvers to pocket a larger share of the profits from the boom in natural gas production in West Virginia. This lawsuit was among the royalty cases highlighted last year in a joint examination by the Charleston Gazette-Mail and ProPublica that showed how West Virginia’s natural gas producers avoid paying royalties promised to thousands of residents and businesses. The plaintiffs said EQT was improperly deducting transporting and processing costs from their royalty payments. EQT said its royalty payment calculations were correct and fair. A trial was scheduled to begin in November but was canceled after the parties reached the tentative settlement. Details of the settlement were unsealed earlier this month. Under the settlement agreement, EQT Production Co. will pay the $53.5 million into a settlement fund. The company will also stop deducting those post-production costs from royalty payments. “This was an opportunity to turn over a new leaf in our relationship with our West Virginia leaseholders and this mutually beneficial agreement demonstrates our renewed commitment to the state of West Virginia,” EQT’s CEO, Robert McNally, said in a prepared statement. EQT is working to earn the trust of West Virginians and community leaders, he said. Funds will be distributed to people who leased the rights to natural gas beneath their land in West Virginia to EQT between Dec. 8, 2009, and Dec. 31, 2017. EQT will also pay up to $2 million in administrative fees to distribute the settlement. Settlement payments will be calculated based on such factors as the amount of gas produced and sold from each well, as well as how much was deducted from royalty payments. The number of people who submit claims could also affect settlement payments. Each member of the class that submits a claim will receive a minimum payment of at least $200. The settlement allows lawyers to collect up to one-third of the settlement, or roughly $18 million, subject to approval from the court. The settlement is pending before U.S. District Judge John Preston Bailey in the Northern District of West Virginia. The judge gave it preliminary approval on February 11th, which begins a process for public notice of the terms and a fairness hearing July 11 in Wheeling, West Virginia. Payments would not be made until that process is complete. ProPublica is a Pulitzer Prize-winning investigative newsroom.Sign up for The Big Story newsletter to receive stories like this one in your inbox. Everyone has utility meters which measure their gas and/or electricity consumption. Many of those meters are smart meters, installed in homes in both the United States and Britain. How secure are smart meters? First, some background since few consumers know what's installed in their homes. According to the U.S. Energy Information Administration (EIA), there were 78.9 million smart meters installed in the United States by 2017, and residential installations account for 88 percent of that total. So, about half of all electricity customers in the United States use smart utility meters. "Two-way or AMI (advanced metering infrastructure) meters allow utilities and customers to interact to support smart consumption applications...The deployment and use of AMI and AMR meters vary greatly by state. Only 5 states had an AMI penetration rate above 80 percent. High penetration rates are seen in northern New England, Western states, Georgia and Texas. 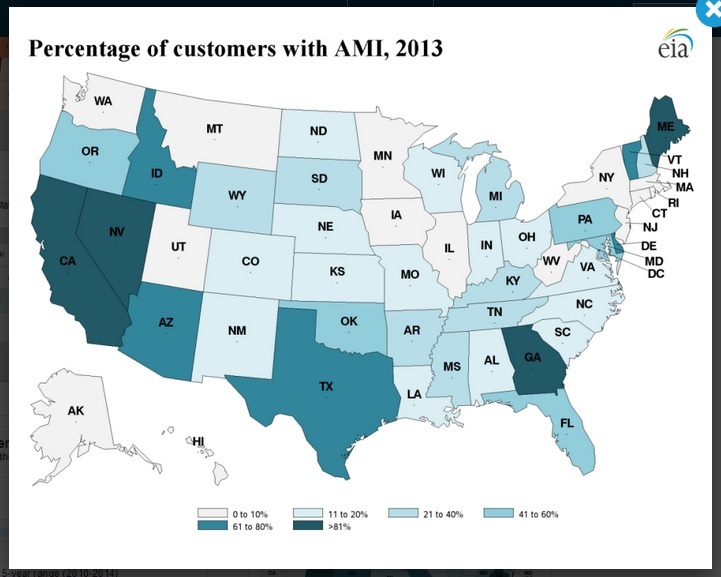 California added the most AMI meters of any state in 2013... There were 6 states with AMR penetration rates above 80 percent with Rhode Island the leader at 95 percent. The highest penetration rates are in the Rocky Mountain, Upper Plains and Southern Atlantic states. New York added nearly 540,000 AMR meters in 2013. Pennsylvania lost 580,000 AMR meters, but gained almost 620,000 AMI meters..."
See the chart on the right for two-way installations by state. Readers of this blog are aware of the privacy issues. A few states allow users to opt out of smart meters. Since the wireless transmissions occur throughout each month, smart meters can be used to profile consumers with a high degree of accuracy (e.g., the number of persons living in the dwelling, when you're home and the duration, which electric appliances are used, the presence of security and alarm systems, special equipment such as in-home medical equipment, etc.). "... is more convinced than ever that evidence now exists that rogue chips may be embedded into electronic circuit boards during the manufacturing process, such as those contained within utility smart meters. Smart meters can be considered high value targets for hackers due to the existence of the “remote disconnect” feature included as an option for most smart meters deployed today." So, smart meters are part of the "smart power grid." If smart utility meters can be hacked, then the power grid -- and residential utility services -- can be interrupted or disabled. The remote-disconnect feature allows the utility to remotely turn off a meter. Smart meters in the United States have this feature, too. Reportedly, utilities say that they've disabled the feature. However, if the supply chain has been compromised with hacked chips (as this Bloomberg report claimed with computers), then bad actors may indeed be able to turn on and use the remote-disconnect feature in smart utility meters. You can read for yourself the report by security researcher Nick Hunn. Clearly, there is more news to come about this. I look forward to energy providers assuring consumers how they've protected their supply chains. What do you think? North Carolina Provides Its Residents With an Opt-out From Smart Meter Installations. Will It Last? Wise consumers know how smart utility meters operate. Unlike conventional analog meters which must be read manually on-site by a technician from the utility, smart meters perform two-way digital communication with the service provider, have memory to digitally store a year's worth of your usage, and transmit your usage at regular intervals (e.g., every 15 minutes). Plus, consumers have little or no control over smart meters installed on their property. "Residents who say they suffer from acute sensitivity to radio-frequency waves can say no to Duke's smart meters — as long as they have a notarized doctor's note to attest to their rare condition. The N.C. Utilities Commission, which sets utility rates and rules, created the new standard on Friday, possibly making North Carolina the first state to limit the smart meter technology revolution by means of a medical opinion... Duke Energy's two North Carolina utility subsidiaries are in the midst of switching its 3.4 million North Carolina customers to smart meters..."
"... Duke had proposed charging customers extra if they refused a smart meter. Duke wanted to charge an initial fee of $150 plus $11.75 a month to cover the expense of sending someone out to that customer's house to take a monthly meter reading. But the Utilities Commission opted to give the benefit of the doubt to customers with smart meter health issues until the Federal Communications Commission determines the health risks of the devices." The Smart Grid Awareness blog contains more information about activities in North Carolina. There are privacy concerns with smart meters. Smart meters can be used to profile consumers with a high degree of accuracy and details. One can easily deduce the number of persons living in the dwelling, when they are home and the duration, which electric appliances are used when they are home, the presence of security and alarm systems, and any special conditions (e.g., in-home medical equipment, baby appliances, etc.). Other states are considering similar measures. The Kentucky Public Service Commission (PSC) will hold a public meeting only July 9th and accept public comments about planned smart meter deployments by Kentucky Utilities Co. (KU) and Louisville Gas & Electric Company (LG&E). Smart meters are being deployed in New Jersey. "HB 56 is a sensible and effective response to an emerging privacy issue facing Maryland residents. Smart meters collect detailed personal data about the use of utility services. With a smart meter, it is possible to determine when a person is in a residence, and what they are doing. Moreover the routine collection of this data, without adequate privacy safeguards, would enable ongoing surveillance of Maryland residents without regard to any criminal suspicion." "HB 56 does not prevent law enforcement use of data generated by smart meters; it simply requires that law enforcement follow clear procedures, subject to judicial oversight, to access the data generated by smart meters. HB 56 is an example of a model privacy law that enables innovation while safeguarding personal privacy." That's a worthy goal of government: balance the competing needs of the business sector to innovate while protecting consumers' privacy. Is a medical opt-out sufficient? Should Fourth Amendment constitutional concerns apply? What are your opinions? "Between on or about May 14, 2014 and on or about May 23, 2014, ExxonMobil violated § 589.201 of the Ukraine-Related Sanctions Regulations when the presidents of its U.S. subsidiaries dealt in services of an individual whose property and interests in property were blocked, namely, by signing eight legal documents related to oil and gas projects in Russia with Igor Sechin, the President of Rosneft OAO, and an individual identified on OFAC’s List of Specially Designated Nationals and Blocked Persons. OFAC determined that ExxonMobil did not voluntarily self-disclose the violations to OFAC, and that the violations constitute an egregious case." During March of 2014, Russia officially annexed Crimea, a peninsula in the Black Sea, from Ukraine. Moscow retaliated by banning nine U.S. officials and lawmakers from entering Russia. Then, President Obama ordered more sanctions against two-dozen members of Putin's inner circle and against Bank Rossiya, the Russian bank supporting them. During August of 2014, Russian troops invaded eastern areas of Ukraine along the country's southeast coast. Reportedly, Russian troops fought with pro-Russia rebels against Ukrainian military. "... ExxonMobil did not voluntarily self-disclose the violations to OFAC and that the violations constitute an egregious case. Both the base civil monetary penalty and the statutory maximum civil monetary penalty amounts for the violations were $2,000,000. OFAC thoroughly considered the arguments ExxonMobil set forth in its submissions to OFAC, and the penalty amount reflects OFAC's consideration of the following facts and circumstances... OFAC considered the following to be aggravating factors: (1) ExxonMobil demonstrated reckless disregard for U.S. sanctions requirements when it failed to consider warning signs associated with dealing in the blocked services of an SDN; (2) ExxonMobil's senior-most executives knew of Sechin's status as an SDN when they dealt in the blocked services of Sechin; (3) ExxonMobil caused significant harm to the Ukraine-related sanctions program objectives by engaging the services of an SDN designated on the basis that he is an official of the Government of the Russian Federation contributing to the crisis in Ukraine; and (4) ExxonMobil is a sophisticated and experienced oil and gas company that has global operations and routinely deals in goods, services, and technology subject to U.S economic sanctions and U.S. export controls. OFAC considered the following to be a mitigating factor: ExxonMobil has not received a penalty notice or Finding of Violation from OFAC in the five years preceding the date of the first transaction giving rise to the violation..."
It seems that OFAC would have fined ExxonMobil more if it could have. During 2016, ExxonMobil generated sales revenues of $197.52 billion and net income of $7.84 billion. So, the company can easily afford this fine. ExxonMobil issued a press release on July 20 which denied the violations and claimed that it had received clear guidance from the Treasury Department that the transactions were legal, "so long as the activity related to Rosneft’s business and not Sechin’s personal business." The press release also cited several news sources. You'd think that the company's executive would simply have gone straight to the source, the OFAC, and bypassed intermediaries. "ExxonMobil claims that it interpreted press statements as establishing a distinction between Sechin's "professional" and "personal" capacity, in part citing to a news article published in April 2014 that quoted a Department of the Treasury representative as saying that a U.S. person would not be prohibited from participating in a meeting of Rosneft' s board of directors. However, that brief statement did not address the conduct in this case. Furthermore, the plain language of the Ukraine-Related Sanctions Regulations (which were issued after the Executive branch statements) and E.O. 13661 do not contain a "personal" versus "professional" distinction, and OFAC has neither interpreted its Regulations in that manner nor endorsed such a distinction. The press release statements provided context for the policy rationale surrounding the targeted approach during the early days of the Ukraine crisis, which was to isolate designated individuals who were targeted as a result of the crisis in Ukraine, rather than imposing blocking sanctions on the large companies that they managed. No materials issued by the White House or the Department of the Treasury asserted an exception or carve-out for the professional conduct of designated or blocked persons, nor did any materials suggest that U.S. persons could continue to conduct or engage in business with such individuals. Separately, there was a Frequently Asked Question (FAQ) publicly available on the OFAC website at the time of the violations that specifically spoke to the conduct at issue in this case..."
The Enforcement Information document is available at the Treasury Department's website and here (Adobe PDF). While at the Treasury Department's website, I noticed that the Treasury Notes blog stopped publishing on January 19, 2017 -- about the same time as the Presidential Inauguration. What's up with that? Does the Treasury Department, under the Trump Administration, believe that it is okay not to inform citizens, taxpayers, and voters? Starting in 2008, ProPublica published stories that found hydraulic fracking had damaged drinking water supplies across the country. The reporting examined how fracking in some cases had dislodged methane, which then seeped into water supplies. In other instances, the reporting showed that chemicals related to oil and gas production through fracking were winding up in drinking water, and that waste water resulting from fracking operations was contaminating water sources. Many environmentalists hailed the reporting. The gas drilling industry, for its part, pushed back, initially dismissing the accounts as anecdotal at best. This week, the Environmental Protection Agency issued its latest and most thorough report on fracking's threat to drinking water, and its findings support ProPublica's reporting. The EPA report found evidence that fracking has contributed to drinking water contamination 2014 "cases of impact" 2014 in all stages of the process: water withdrawals for hydraulic fracturing; spills during the management of hydraulic fracturing fluids and chemicals; injection of hydraulic fracturing fluids directly into groundwater resources; discharge of inadequately treated hydraulic fracturing wastewater to surface water resources; and disposal or storage of hydraulic fracturing wastewater in unlined pits, resulting in contamination of groundwater resources. In an interview, Amy Mall, a senior policy analyst at the National Resources Defense Council, said the EPA's report was welcome. "Many of us have been working on this issue for many years, and industry has repeatedly said that there is no evidence that fracking has contaminated drinking water," Mall said. The EPA report comes a year after its initial set of findings set off fierce criticism by environmental advocates and health professionals. That report, issued in 2015, said the agency had found no evidence that fracking had "led to widespread, systemic impacts on drinking water resources." Many accused the agency of pulling its punches and adding to confusion among the public. News organizations throughout the U.S. interpreted the EPA's language to mean it had concluded fracking did not pose a threat to water supplies and public health. The EPA said in its report this week that the sentence about the lack of evidence of systemic issues had been intentionally removed because the agency's scientists had "concluded it could not be quantitatively supported." "I think one of the concerns about the original document was that the EPA seemed to say that everything was fine," said Rob Jackson, a professor of earth-system science at Stanford University. "It's important that we understand the ways and the cases where things have gone wrong, to keep them from happening elsewhere." The EPA's latest declaration comes as a Trump administration apparently hostile to almost any kind of regulation of fracking prepares to assume office. But those worried about fracking's implications for the environment have long been discouraged by the lack of consistent and stringent state or federal regulation. "Because state regulators have not fully investigated cases of drinking water contamination, and because federal regulators have been handcuffed by Congress into how much they can regulate, the science wasn't as robust as it should have been," said Mall, the analyst at NRDC. "It's a pattern of, the rules are too weak, and the ones that are on the books aren't enforced enough." The more significant impact of a Trump administration, however, may be in limiting the EPA's appetite for aggressive and continued study. The report issued this week was six years in the making, but made clear there was still much work to be done to better and more comprehensively determine fracking's impact on the environment, chiefly water supplies. "It was not possible to calculate or estimate the national frequency of impacts on drinking water resources from activities in the hydraulic fracturing water cycle or fully characterize the severity of impacts," the report said. The Trump administration's transition team did not immediately respond to an e-mailed request for comment about its position on fracking and the EPA's final report. Trump's transition website promises to "unleash an energy revolution" and "streamline the permitting process for all energy projects." It also says it will "refocus the EPA on its core mission of ensuring clean air, and clean, safe drinking water for all Americans." Advocates for hydraulic fracturing argue that the final EPA report is not vastly different from the draft version. "Anecdotal evidence about localized impacts does not disprove the central thesis, which is that there is no evidence of widespread or systemic impacts," said Scott Segal, a partner at Bracewell LLP who represents oil and gas developers. "There's a lot of exaggeration. There's a lot of mischaracterization of the extent of contamination that's based on a desire to enhance recovery in tort liability lawsuits." Read more of ProPublica's major work on fracking. "Five months before Saturday's 5.6 magnitude temblor in central Oklahoma, government scientists warned that oil and natural gas drilling had made a wide swath of the country more susceptible to earthquakes. 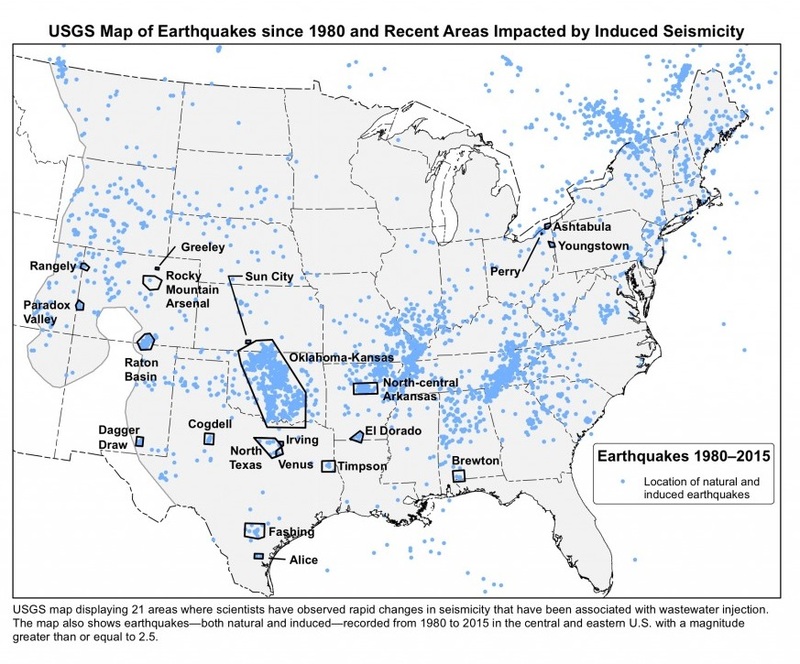 The U.S. Geological Survey (USGS), in a March report on "induced earthquakes," said as many as 7.9 million people in parts of Kansas, Colorado, New Mexico, Texas, Oklahoma and Arkansas now face the same earthquake risks as those in California. The report found that oil and gas drilling activity, particularly practices like hydraulic fracturing or fracking, is at issue... Saturday's earthquake spurred state regulators in Oklahoma to order 37 disposal wells, which are used by frackers, to shut down over a 725-square mile area... The quake that struck Saturday is at least the second of its size to affect central Oklahoma since 2011." What are "disposal wells?" A variety of activities produce waste stored using "Class I Disposal Wells:" petroleum refining, metal production, chemical production, pharmaceutical production, commercial disposal, food production, and municipal wastewater treatment. According to the U.S. Environmental Protection Agency (EPA), these Class I wells are further categorized into four types: municipal, non-hazardous, hazardous, and radioactive. The EPA site also explains the other Classes of wells: II, III, IV, V, and VI. So, a lot of industries besides fracking pump liquids into the ground -- deep into the ground; both to extract resources and to deposit waste. "The most significant hazards from induced seismicity are in six states, listed in order from highest to lowest potential hazard: Oklahoma, Kansas, Texas, Colorado, New Mexico and Arkansas. Oklahoma and Texas have the largest populations exposed to induced earthquakes." “In the past five years, the USGS has documented high shaking and damage in areas of these six states, mostly from induced earthquakes... the USGS Did You Feel It? website has archived tens of thousands of reports from the public who experienced shaking in those states, including about 1,500 reports of strong shaking or damage.” In developing this new product, USGS scientists identified 21 areas with increased rates of induced seismicity. Induced earthquakes have occurred within small areas of Alabama and Ohio but a recent decrease in induced earthquake activity has resulted in a lower hazard forecast in these states for the next year. In other areas of Alabama and small parts of Mississippi, there has been an increase in activity, and scientists are still investigating whether those events were induced or natural." Lets unpack this. First, risk varies based upon where you live. Second, risk varies with time. The USGS risk models include both one-year and 50-year outlooks. So, the risk in an area may be low during the coming year, but very different (e.g., higher) when considering what might happen during the next 50 years. That sounds a lot like floods. A huge, devastating flood may not happen often -- perhaps once every 50 or 100 years, but when it does... the damage and costs are considerable. Third, you don't need to live near or adjacent to a well to be affected. Note the areas named: Alice, Ashtabula, Brewton, Cogdell, Dagger Draw, El Dorado, Fashbing, Greeley, Irving, North-Central Arkansas, North Texas, Oklahoma-Kansas, Paradox Valley, Perry, Raton Basio, Rangely, Rocky Mountain Arsenal, Sun City, Timpson, Venus, and Youngstown. The USGS advises persons living in areas with higher earthquake risks to learn how to prepare, and visit FEMA's Ready Campaign website. "Injecting fluid underground can induce earthquakes, a fact that was established decades ago by USGS scientists. This process increases the fluid pressure within fault zones, essentially loosening the fault zones and making them more likely to fail in an earthquake... even faults that have not moved in historical times can be made to slip and cause an earthquake... There are several purposes for injecting fluid underground. The three main reasons are wastewater injection, hydraulic fracturing and enhanced oil recovery. Within the United States, each of these three activities has induced earthquakes to varying degrees in the past few years. All three types of wells used for these purposes are regulated under the Safe Drinking Water Act with minimum standards set by the U.S. Environmental Protection Agency. Additional regulations vary by state and municipality. Other purposes for injecting fluid underground include enhanced geothermal systems and geologic carbon sequestration." "Fact 5: Induced seismicity can occur at significant distances from injection wells and at different depths. Earthquakes can be induced at distances of 10 miles or more away from the injection point and at significantly greater depths than the injection point." So, to be affected you don't have to live near or adjacent to a disposal well or injection point. Alert readers will notice that the EPA's classification system for wells and injection points largely mirrors the different types of human activities... which really seem to be mostly corporate activities. Do you live in or near one of the 21 areas? What are your opinions? Recently, I received a phone call offering "discounts on my Eversource bill." The caller identified himself as "Kevin." I have no idea if that is his real name. Kevin explained that I could get discounts by giving him some simple personal information. His then asked for my ZIP Code. Right. I was born at night, but not last night. I told Kevin that I don't share my personal information over the phone without knowing who the caller is. I asked him to provide four items: a) his full name, b) his company name, c) his company's phone number, and d) his company's website address. Kevin replied, "okay." The next thing I heard was a loud click as he hung up. 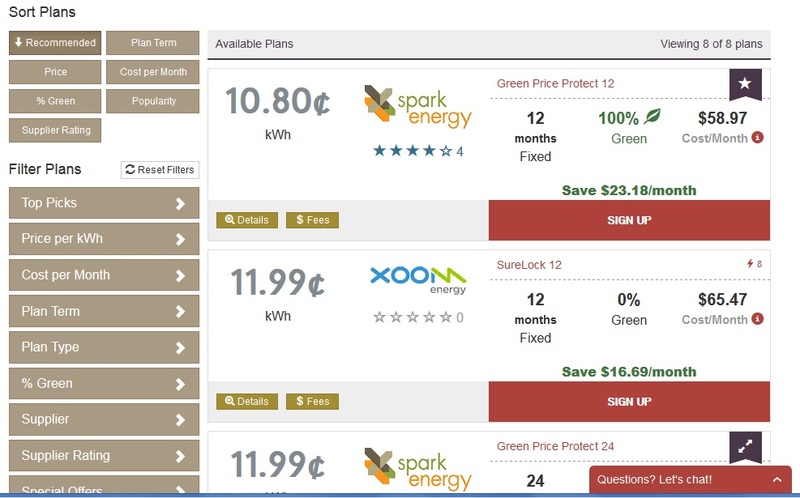 Now, there are real companies offering discounts on electric utilities. Clearly, Kevin was not one of them. After receiving robocalls before from energy scammers, I have learned to demand these four data elements before sharing any personal information on the phone. "1. Always verify whether these callers are legitimate by asking for some basic information about your account. Our representatives will always be able to provide the name on the account, the account address, and the exact past due balance. 2. Never immediately pay, regardless of what the caller knows about your account. If they request an immediate payment using a third-party service, at another location or via a prepaid debit card, hang up immediately and contact us directly to verify your account status. 3. If you are suspicious, hang up and call us ​at 800-592-2000. Also, please report this to your local law enforcement. 4. Never wire money to someone you don’t know – regardless of the situation. Once you wire money, you cannot get it back. 5. Do not accept offers from anyone, including those claiming to be Eversource employees, to pay your bill or provide any other service for a fee. 6. Do not click on links or call numbers that appear in unexpected emails or text messages – especially those asking for your account information. If you click on a link, your computer could become infected with malware, including viruses that can steal your information and compromise your computer." And, learn how to spot these five energy scams. Demanding that the caller clearly and completely identify their self also seems to work. Shut-off Threats: callers claim to represent the Billing or Disconnect Department, and state that your power will be shut off if you don't make a payment immediately. Pay immediately: callers instruct you to make a payment immediately to a third-party location, such as a grocery store, or to a "Green Dot" VISA card. Then, the scammer directs victims to call another phone number to report the card payment information, so the scammers can drain the card account online. Faulty meters: callers claim your electric (or gas) meter is broken and it overcharging you. Then, the scammer directs victims to buy a $200.00 prepaid card. The scammers calls again claiming the first payment hasn't posted, and the consumer should buy a $300.00 prepaid card. Of course, the scammer lies about the meter being fixed soon. Unsolicited technician: a door-to-door person, with a hard-to-read badge, claims he is there to check your usage since your neighbors reported have claimed about high monthly bills. Unsolicited salesperson: a door-to-door person claims there is a problem with your utilities, and you failed to respond to urgent notices. The scammers insisted that you could get a rebate, or savings, but needs to see a copy of your energy bill. "Eversource would never ask you to purchase prepaid cards or make an immediate payment at a third-party location, like a grocery store. We have a very secure, protected billing system, and you have multiple, convenient options to pay your bills, including direct debit, check, credit card and cash. Customers who are scheduled for disconnection due to nonpayment receive written notice that includes the actions they can take to maintain service... All [Eversource] employees carry company-issued identification, and any electrical contractors working with us carry documentation explaining the nature and location of their work. Customers can always call us to verify this information. Eversource would never solicit door-to-door or over the phone on behalf of a specific competitive/alternate energy supplier." "Never provide personal financial or utility account information to any unsolicited individual, in person, on the phone, or online, even if the individual seems legitimate." "Always verify whether these contacts are legitimate by asking for some basic information about your account. Our representatives will always be able to provide the name on the account, the account address, and the exact past due balance. If the caller cannot provide that information, the call is not from us." If you use a different energy provider, check it's website for scams. For example, earlier this month PG&E warned its customers in California about similar scams. I've received some of these robocalls from scammers. Long ago, I registered both my landline and mobile phone numbers in the National Do Not Call Registry. When I receive unwanted and un-requested robocalls, I hang up the call immediately and submit a complaint to the U.S. Federal Trade Commission (FTC). You should, too. "... Tillerson, a vocal proponent of hydraulic fracking, who is suing to prevent the construction of a water tower near his eighty-three-acre, $5 million horse ranch in Bartonville, Texas. The purpose of the tower? Storing water for fracking. Tillerson and his super-wealthy neighbors are concerned, the lawsuit states, that the fracking tower might “devalue their properties..."
By implication, this means it is better to locate fracking activities in or near neighborhoods of poor and middle-income people. They won't mind, right? "ExxonMobil, the world’s biggest oil company, knew as early as 1981 of climate change – seven years before it became a public issue, according to a newly discovered email from one of the firm’s own scientists. Despite this the firm spent millions over the next 27 years to promote climate denial. The email from Exxon’s in-house climate expert provides evidence the company was aware of the connection between fossil fuels and climate change, and the potential for carbon-cutting regulations that could hurt its bottom line, over a generation ago... Exxon’s public position was marked by continued refusal to acknowledge the dangers of climate change, even in response to appeals from the Rockefellers, its founding family... Over the years, Exxon spent more than $30m on think tanks and researchers that promoted climate denial, according to Greenpeace. Exxon said on Wednesday that it now acknowledges the risk of climate change and does not fund climate change denial groups." 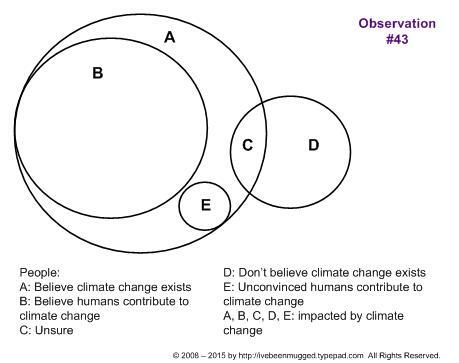 Learn more: global attitudes toward climate change, opinions by adults in the USA, and what is considered settled climate change science. "... a series of concrete steps that businesses can take to enhance and protect consumers’ privacy and security... The Internet of Things is already impacting the daily lives of millions of Americans through the adoption of health and fitness monitors, home security devices, connected cars and household appliances... Such devices offer the potential for improved health-monitoring, safer highways, and more efficient home energy use... However, the FTC report also notes that connected devices raise numerous privacy and security concerns that could undermine consumer confidence." "... our discussion is limited to IoT devices that are sold to or used by consumers. Accordingly, the report does not discuss devices sold in a business-to-business context, nor does it address broader machine-to-machine communications that enable businesses to track inventory, functionality, or efficiency..."
"... connected medical devices can allow consumers with serious medical conditions to work with their physicians to manage their diseases. In the home, smart meters can enable energy providers to analyze consumer energy use, identify issues with home appliances, and enable consumers to be more energy-conscious. On the road, sensors on a car can notify drivers of dangerous road conditions, and software updates can occur wirelessly, obviating the need for consumers to visit the dealership..."
"... a variety of potential security risks that could be exploited to harm consumers by: (1) enabling unauthorized access and misuse of personal information; (2) facilitating attacks on other systems; and (3) creating risks to personal safety. Participants also noted that privacy risks may flow from the collection of personal information, habits, locations, and physical conditions over time. In particular, some panelists noted that companies might use this data to make credit, insurance, and employment decisions..."
Monitor products (and services) throughout the life-cycle and patch known vulnerabilities. "This does not mean that every data collection requires choice. The Commission has recognized that providing choices for every instance of data collection is not necessary to protect privacy. In its 2012 Privacy Report, which set forth recommended best practices, the Commission stated that companies should not be compelled to provide choice before collecting and using consumer data for practices that are consistent with the context of a transaction or the company’s relationship with the consumer. Indeed, because these data uses are generally consistent with consumers’ reasonable expectations, the cost to consumers and businesses of providing notice and choice likely outweighs the benefits. This principle applies equally to the Internet of Things." "Staff acknowledges the practical difficulty of providing choice when there is no consumer interface and recognizes that there is no one-size-fits-all approach. Some options include developing video tutorials, affixing QR codes on devices, and providing choices at point of sale, within set-up wizards, or in a privacy dashboard. Whatever approach a company decides to take, the privacy choices it offers should be clear and prominent, and not buried within lengthy documents." Last, the report discussed the current state of legislation. the consensus seemed to be that more is needed at both the state and federal levels. Download the FTC report: "Internet of Things: Privacy & Security In a Connected World" (Adobe PDF) from the FTC site. A copy is also available here. What are your opinions of the Internet of Things? Of the recommended best practices? How would you like IoT manufacturers to delivery policies before purchase? Recently, sales representatives from several energy companies rang our doorbell. Some of the electric company names: Direct Energy, Just Energy, and Spark Energy. My wife and I listened to some of their pitches, because our electric bill went up during the past few months. Way up. This blog post discusses what we experienced and learned during our search for another electric company, including some online tools and the criteria we developed. I've written about some of the companies in this blog. A sales rep from Just Energy first visited in 2010. Should you decide to switch to another electric company, that's something only you can decide. You know your electricity needs and home situation best. Hopefully, this blog post will help you identify the considerations to make the best decision possible. "Delivery charges include: distribution, transmission and transition charges, as well as costs related to the development of renewable energy sources and efficiency programs... The only way to reduce the delivery portion of your bill is to use less electricity..."
"Generation is the act of converting various forms of energy (such as oil, gas, coal, sun, wind or nuclear) into electricity. Generation is the only part of the electric industry that has been opened to competition. The transmission and distribution of your electricity will continue to be regulated..."
Competition started In Massachusetts in March 1998 after passage of the Massachusetts Electric Industry Restructuring Act of 1997 (“Restructuring Act”). EverSource (formerly N-Star) is the utility that provides our electricity. You'll probably want to analyze your bills like we did. Our residential usage averages about 300 KWH monthly. So, delivery charges decreased slightly while generation charges have almost doubled. Not good. So, we started to shop around for service from another electric company. The sales representative from Direct Energy quoted (verbally) a price of about 9 cents per KWH. An online search found a C+ rating of Direct Energy by the Better Business Bureau (BBB). Too many complaints and too many unresolved complaints. Not good. Some of the complaints were similar to what we'd learned about Just Energy. The door-to-door sales representatives were mostly college-age students. Most immediately demanded to see our monthly utility bills without first fully explaining their offers. A general statement about a fixed, lower price is not enough. Protect your sensitive information: do not show your utility bills to door-to-door sales people. Only show your utility bills after you have decided to do business with a provider. Be cautious: your current service provider does not send door-to-door sales people. Know your rights: do not let door-to-door sales people into your home unless you know them personally. Contact local police if the sales agent refuses to leave or you believe you are threatened. The flyer quoted $36.00 in monthly savings. It is important to read the fine print because that quote was based upon a home using 1,000 KWH per month. Do you use 1,000 KWH in a month? We don't. Not even close. We use about a third of that, or 300 KWH per month. So, our savings would be far less: (14.90 - 10.80 cents per KWH) X 300 KWH = $12.30. Big difference. It presented several plans for where I live. Some plans included renewable energy sources, with a higher price. 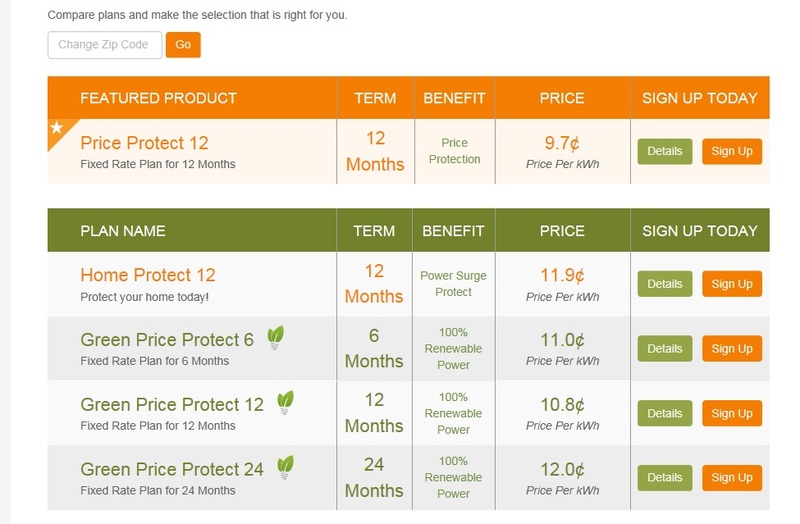 I selected the "Details" link for the Price Protect 12 Month plan. It mentioned a $4.95 monthly fee and a $100.00 early termination fee. Not good. This meant our savings would be even smaller: about $7.35 (equals $12.30 - $4.95) monthly if we had purchased this plan. That's about the price of two cups of coffee and a doughnut. Not much. There were several plans; some from the same provider. The plans differed by KWH price, by duration (e.g., six, 12, or 24 months), by renewal energy mix (ranging from zero to 100%), and by fees (e.g., early termination fees from $100 to $200). The site has some strengths and weaknesses. The key strengths: it's free, easy to read, can easily sort the list of plans, and can easily access contract details about each plan. The key weaknesses: uses a high default KWH usage, can't search for by specific fee type (e.g., monthly, termination, billing, deposit, etc. ), and ambiguity about what happens at the end of the contract or when you move. At the end of the contract, many plans default to a higher, variable price. That may be good for the electric company, but not good for consumers who want a predictable low price. I wanted to search for plans that auto-renew from a low fixed price to another low fixed price. The site doesn't seem to provide that search feature. "XOOM is an independent retail marketer of electricity and is not affiliated with your local utility. Your local utility will continue to deliver your electricity, read your meter, send your bill, and make necessary repairs. Your local utility will also respond to emergencies..."
"If a consumer selects a competitive supplier, he/she will be paying both the distribution company (for the delivery charge) and the competitive supplier (for the generation charge). Depending on the competitive supplier, the consumer may receive one bill (combined billing) or two separate bills. In general, smaller consumers (residential and small commercial) will receive one bill from the distribution company. The distribution company will then transmit generation charges to the consumer’s chosen competitive supplier." So, when you switch to another electric company, it's really a partial switch. You might get a single monthly bill or you might get two monthly bills. The legacy utility still has a role to deliver your electricity and maintaining the electric grid. Deregulation hasn't changed who produces electricity. Deregulation only lets consumers select from a larger group of power suppliers. The two-bill possibility highlights the economics of the electric power industry. It requires a massive amount of money to build (and maintain) a power plant. Even more to build (and maintain) the electric grid: the network of power lines and facilitates that carry and distribute electricity from power plants to your home. No supplier can afford to build a parallel, duplicate structure. So, regulation was used to guide a naturally monopolistic industry to avoid abuses. Maybe you studied this in economics classes during college. We've seen this economic situation before. Telecommunications. Originally, there was a single supplier (AT&T or "Ma Bell") guided by regulation. Then, the market was deregulated in the 1980s with local service providers and long-distance providers. With that deregulation, competing companies still shared the existing infrastructure of phone lines and local facilities. Economically, it wasn't feasible to build duplicate, parallel structures. With the introduction of wireless services, suppliers began building their own networks. Some got out of the landline business. All of this raises the question: what benefits have electric deregulation provided consumers? Deregulation seems to have fallen far short on its promises. Advocates promised lower prices from competition. The fact is competition exists only with electric generation. We consumers have gotten slightly lower prices in some instances, and far higher prices in many other instances. Remember, after crunching the numbers we found the savings were minimal; eaten up by monthly and other fees. And, that savings assumed no price spikes at the end of the contract. So, the Choose Energy site seems like place to start your search. it's mildly helpful but lacking some key features. It would be more helpful it it included a search parameter for plans guaranteeing single, consolidated monthly bills. The site lets you filter or narrow your search results to plans that have or don't have fees. That was mildly helpful, but it seemed too general and inconsistent. For example: I filtered my list for plans to show only plans without fees. The site presented a Just Energy plan where the contract fine print stated it might pass through a Billing Fee from the Utility. What's that? How much? Neither the site nor the contract explained this. I expected more. A "no fees" filter option should mean just that. And, there's the issue of deposits. Some plans require them. This should be a search parameter, too. Provide searching by contract end terms. 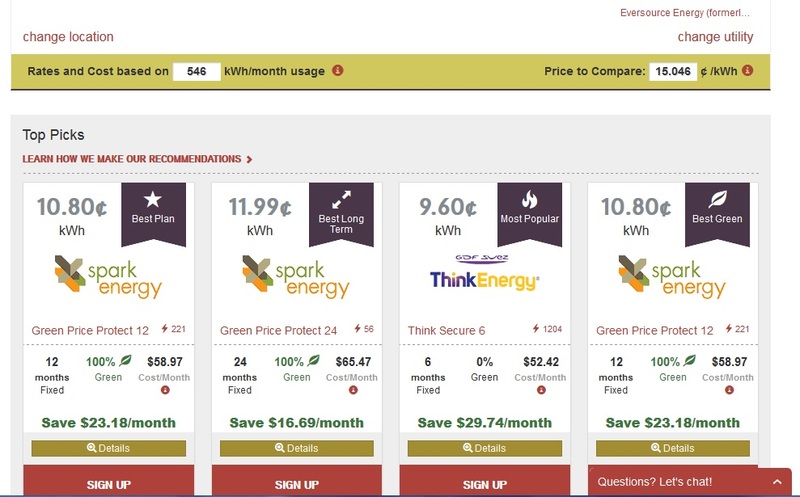 "Choose Energy™ is an easy-to-use online marketplace that helps residents and businesses comparison-shop for their ideal energy supplier... that provides a convenient and secure way for consumers to compare rates and plans for energy suppliers in their area – and make the switch all in one place. Plans are curated from only reliable and trusted suppliers and provide renewable options as well as flexible pricing to ensure customers find the plan that best fits their needs. Choose Energy is available in 11 states currently, with additional states coming on-line in 2014. Typical content. I expected more. The copy was old, too. It's 2015, not 2014. If the site can't update this, then I wonder what else is lacking. The site should explain its process and criteria for curating plans and providers. If it has an explanation, I couldn't find it. A sales person from Direct Energy visited our home, but the Choose Energy site didn't display any Direct Energy plans for my ZIP Code. Why the difference? Which is correct? 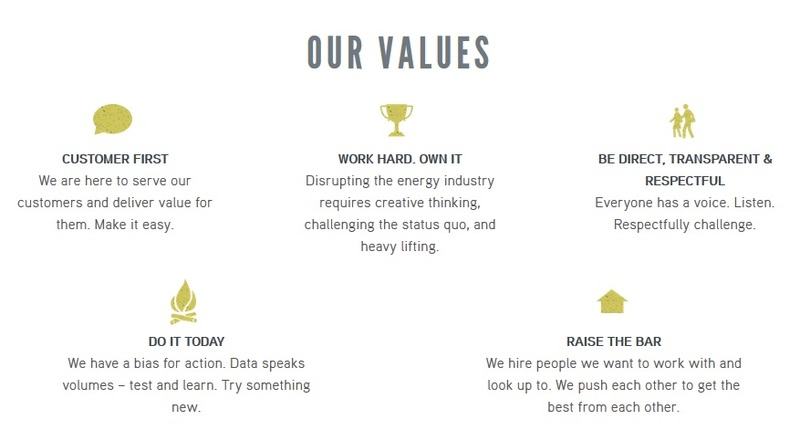 For the executives at Choose Energy, I have this feedback: if you are serious about disrupting the industry, raising the bar, and being transparent, then do it. No half measures. Include the additional search parameters suggested above. Your site page describing Just Energy doesn't mention the company's $4 million payment to settle deceptive marketing allegations. Why not? That seems like pretty important information for consumers to know. Don't hide stuff. Elevate all of the important details from contractual copy. Make it searchable. Explain your curate process. Surface all the nitty-gritty. That's what consumers want. Half measures give the impression that your site is nothing more than a slick industry marketing scheme, and not a reliable, independent information resource for consumers. "In Massachusetts, over 80% of our electricity is generated from fossil fuels and nuclear power resources... the remainder comes in the forms of trash-to-energy, large hydro projects, various, unidentified types of power imported from other regions, and other sources that are not environmentally friendly. A state law, the Renewable Portfolio Standard, requires your utility to include just 8% new renewables in 2013, with a 1% increase per year. Your utility is required to send you a quarterly disclosure label which describes in detail the energy sources and emissions resulting from the electricity you use... All New England states share one single network of power lines, called the electric grid. Generators from all over the region feed power into this grid and energy is drawn out on an as-needed basis. Since our electricity is based on a regional mix, the electricity that is actually delivered to your home is determined by which power generators are located closest to you..."
"Mass Energy is a non-profit organization, and your payments are recognized as being made for the public good. They are considered a tax-deductible charitable contribution for federal income tax purposes, if you itemize on your federal return. If you are enrolled in New England GreenStart, you would be able to deduct 2.4 cents for each kilowatt hour... If you are enrolled in New England Wind, you would be able to deduct 3.8 cents per kilowatt hour... You cannot get this benefit from any other renewable energy supplier in Massachusetts..."
So, while you might pay a little more for energy from renewable sources, there is the tax-deduction benefit to consider. More numbers to crunch. As we searched for an alternative electric company, there was more to consider than we first thought. No way is this an impulse purchase. Some states offer their residents websites that compile offers from several electric providers into a single place. If you live in Texas, visit Power To Choose. The Choose Energy site covers Massachusetts and several other states: Connecticut, Illinois, Maine, Maryland, Michigan, New Jersey, New York, Pennsylvania, and the District of Columbia. I am sure that there are other sites for other states. A contract with the most consumer-friendly terms possible. Ideally, no monthly fee and an auto-renewal process that won't hike its price of electricity. A provider offering energy from "green" or renewable sources. We live in a small condominium, and the other two owners are not interested in installing solar panels or a small wind turbine. Exterior modifications must be agreed upon by all three unit owners. A reputable provider with good customer satisfaction. Does it have few or many complaints? Does it respond quickly to inquiries? Does it honor its contractual commitments? There are several Internet sources consumers can use. I mentioned the BBB above. Besides news reports about Direct Energy, I read the Glass Door site, which features reviews by current and former employees. If a provider can't keep their employees happy and solve staff churn, then they probably won't keep their customers happy either. A provider that doesn't abuse customers' privacy, and is transparent in their policies about customers' data collected, archived, and shared; and lists its business partners. You'll develop your own list of criteria. You should. You may want the wireless convenience, such as programming your heating/cooling levels with your smartphone. Or you may want your heating/cooling controls integrated with your home security system. Or, you may want a provider that parses your electric usage by appliance consumption. There is a whole new world of choices available. And, it's easy to verify an electric company's identity. The Massachusetts EEA Department maintains a list of licensed companies. If a company that contacted me (via phone, e-mail, etc.) isn't on this list, I wouldn't do business with them. And I definitely wouldn't share my bill details or any personal information. Unhappy with your current electric company? Massachusetts residents can submit complaints online at the Department of Public Utilities (DPU) site, or via phone or postal mail. The bottom line: it is still a roll of the dice. When you switch to another electric company, you are essentially betting that the price in their contract you sign will be lower than the market price, or what you would have paid otherwise. If it is lower, then you've won. If it's higher, then you've lost. Of course, the electric provider is betting against you; that the price you pay them will be higher than what you could have paid otherwise. If the price is lower during your contract, they hope to raise it much higher when your contract ends. After all, a for-profit business has to make its money somehow. That sounds a lot like how consumers purchase wireless plans for smartphones. You sign a two-year contract making three bets: a) the monthly price you pay will be lower than what you might have paid otherwise; b) your calls, texts, and Internet usage won't exceed any caps so you avoid additional fees; and c) you won't have to terminate early and pay a high cancellation fee. How well did you do with your wireless plan choice? A lot of consumers chose poorly and experienced huge monthly wireless bills. Now you know what you' face with electric suppliers. Do your homework, shop wisely, and read contracts before signing them. We're still looking. What sites have you used to research electric suppliers? What criteria did you use when selecting an electric company? Did you switch or stay with your legacy utility? Why? Business leaders and economists like to promote the idea of a free marketplace, where there is plenty of competition and consumers get more benefits, such as lower prices and more choice. So, are consumers getting a good deal? The facts suggest not. 1. U.S. airlines have consolidated into a handful of giant carriers that divide up routes and collude on fares. In 2005 the U.S. had nine major airlines. Now we have just four. 2. 80% of Americans are served by just one Internet Service Provider – usually Comcast, AT&T, or Time-Warner. 3. The biggest banks have become far bigger. In 1990, the five biggest held just 10% of all banking assets. Now the biggest five hold almost 45%. 4. Monsanto owns the key genetic traits in more than 90% of the soybeans and 80% of the corn planted by U.S. farmers. 5. Giant health insurers are larger; the giant hospital chains, far bigger; the most powerful digital platforms (Amazon, Facebook, Google), gigantic. Whatever happened to antitrust enforcement?" There are more examples. Here in the Northeast, EverSource, a publicly-traded utility holding company, provides residential energy services in Connecticut, Massachusetts, and New Hampshire. EverSource was created when Northeast Utilities merged with NSTAR Electric & Gas. Northeast Utilities included Connecticut Light & Power, Public Service of New Hampshire, Western Massachusetts Electric, and Yankee Gas. Earlier this year, electricity rates in Boston rose from 29 percent higher to 63 percent higher in February than the national average. What are your opinions? What consolidation examples come to mind? Are we consumers getting a good deal, or are we getting screwed? "... new technologies are safely unlocking vast domestic supplies of oil and natural gas ..."
"Fracking involves injection of a large volume of water, sand and a cocktail of chemicals (known as fracking fluid) deep underground to fracture the rock and allow gas to seep out. It is also used for oil extraction... the term “fracking” is sometimes used to describe the entire process of drilling for natural gas, but that isn’t accurate. After a well is drilled, cemented and prepared in other ways, only then is the well “fracked” — the actual stimulation of rock far beneath the earth’s surface to allow extraction of the gas." "... the scientists we interviewed say that it doesn’t make sense to separate fracking from the entire gas and oil production process, and there is ample evidence that the overall process can cause contamination of water supplies. As we noted above, the new DOI rules cover the entire process including fracking, well casings and other activities." When you view a commercial or hear a fracking proponent claim that there's no proof that fracking contaminates ground water (e.g., it's safe), you now know otherwise. During an open, honest, and complete conversation about safety everyone defines the terms they use, and hopefully address the entire process. If it's unclear, demand clarification. In my opinion, to claim something is safe while only addressing part of the process is simply dishonest. Words matter. Definitions matter. "Partially in response to [safety] concerns, the Department of the Interior finalized a regulation on March 20 regarding hydraulic fracturing and related activities on public and tribal land. The regulation includes a number of provisions related to fracking and other aspects of natural gas drilling activity. For example, the rule includes “[p]rovisions for ensuring the protection of groundwater supplies by requiring a validation of well integrity and strong cement barriers between the wellbore and water zones through which the wellbore passes.” It has specific requirements for constructing cement casings for wells, and monitoring pressure on certain well parts during fracking operations. And it also requires disclosure of the chemical contents of fracking fluids." "Inhofe, a Republican from Oklahoma who chairs the Senate Environment and Public Works Committee, opposes the regulation. He, along with 26 cosponsors, introduced a bill that would specifically put the responsibility for regulating relevant oil and gas operations in the hands of the states rather than the federal government." That sounds like: if you can't fool all of the people all of the time, then maybe you can fool some of the people. Ground water supplies don't magically stop at state lines or boundaries. Ground water contamination doesn't magically stop at state lines, either. "The federal Energy Policy Act of 2005 contained a provision that has come to be known as the "Halliburton Loophole," an exemption for gas drilling and extraction from requirements in the underground injection control (UIC) program of the Safe Drinking Water Act (SDWA). Other exemptions are also present in the Clean Air Act and Clean Water Act." So, this law was enacted during the Bush-Cheney administration's tenure. That energy producers pursued these exemptions before starting the current fracking boom speaks volumes. They probably knew that water contamination was likely, and/or that they couldn't safely drill and extract oil and gas. So, too, did compliant politicians. You can't have a bright future with polluted drinking water and groundwater. Inhofe's proposed legislation should be opposed. Contact your elected officials, and tell them what you think. What are your opinions of fracking? Should regulations be shifted to only the states? Telemarketers Offer Energy Discounts. Have You Received These Calls? This seems to be the week to receive phone calls from telemarketers. The first call this week was 2:10 pm Tuesday afternoon. It was a robocall offering electric power discounts for people who qualify. The automated message asked me to have my monthly bill ready and to press "5" to speak with a representative. Previously, I have received both phone calls and visits by door-to-door sales people, Plus, I am aware of several utility scams. I was curious to learn what the latest pitch is, so I pressed "5" to continue the call. A representative quickly joined the phone call and asked if I had my bill ready. I said yes, but that I needed to know first who I was talking with. The representative said his name was Robert. No last name. Then, I asked for his company's name and phone number. He said his company was "Power Source," and that he was in their call center. He refused to give a phone number (a typical habit of scam artists; especially those calling from outside the country). Our phone call was off to a bumpy start, and it quickly got worse. I asked Robert for his company's website address. He replied that I could Google the company's name to learn more. Not a very friendly answer. It seemed to me that Robert (probably not his read name) was not going to disclose anything meaningful about Power Source (probably not its real name). Yet, he felt perfectly fine asking me to share details from my utility bill, which I consider highly confidential. The Power Source name is strikingly similar to EverSource, a real, publicly-traded utility holding company that provides residential energy services in Connecticut, Massachusetts, and New Hampshire. EverSource was created when Northeast Utilities merged with NSTAR Electric & Gas. Northeast Utilities included Connecticut Light & Power, Public Service of New Hampshire, Western Massachusetts Electric, and Yankee Gas. I told Robert that since he was unwilling to share any detailed information, neither was I. He said thank you and hung up. "You've probably gotten robocalls about candidates running for office, or charities asking for donations. These robocalls are allowed. But if the recording is a sales message and you haven't given your written permission to get calls from the company on the other end, the call is illegal. In addition to the phone calls being illegal, their pitch most likely is a scam." I have no relationship with a company named Power Source, and my home phone is registered in the national Do Not Call Registry. Consumers can report illegal robocalls at the FTC website. I did. So, if you receive a robocall from Power Source, you now know what to do with it. The second call was 6:15pm Wednesday afternoon. It was a traditional phone call and not a robocall. Again, I asked the caller to identify himself. He said his name was James, who also offered energy discounts for home owners. Again, I asked for his company's name, phone number and website address. He identified his company as Solar Green Energy, but refused to provide a phone number. During the second call, I went online. A quick search for "Solar Green energy" found a dot-com website with that name. The site was for sale, and it didn't provide any details about the company nor its offerings. James insisted that if I qualified, he'd schedule a representative to visit to fully explain the service. I held firm and told him I wasn't sharing anything until I knew more about who I was talking with. He repeated his request for me to share information from my utility bill, and I hung up. "... the Bureau of Labor Statistics said electricity prices in Boston were 63 percent higher than the national average in February — well up from last year, when local prices were 29 percent higher. Utilities have blamed insufficient pipeline capacity to supply the region, coupled with high winter demand." For me, it's simple. If a caller asks me to disclose my personal information while refusing to fully identify their self, their employer, and the services offered, then I don't do business with them. Period. And, I definitely don't do business with illegal robocallers. I expect telemarketers to clearly and completely explain their discount program, first. Have you received phone calls from Power Source or Solar Green Energy? If so, please share your experiences below including the date, time, company name, representative's name, and content of your call. "Money collected from ratepayers and earmarked for pipeline safety was instead spent on executive pay raises by the state's largest utility, Pacific Gas & Electric Co., in the months before a deadly pipeline explosion in 2010... The new head of the Public Utilities Commission wants to increase financial penalties against Pacific Gas & Electric Co. to a record $1.6 billion for negligence related to the 2010 pipeline explosion that killed eight people and leveled a neighborhood in the Bay Area suburb of San Bruno." "Records released a few days after the explosion showed that PG&E received approval in 2007 to spend $5 million of ratepayer money to replace a high-risk section of the 30-inch pipeline north of the San Bruno blast site. The work on the 1950s-era pipe was never performed. And in 2010, the utility asked for another $5 million to do the same job, according to PG&E documents submitted to the PUC." "The California Public Utilities Commission serves the public interest by protecting consumers and ensuring the provision of safe, reliable utility service and infrastructure at reasonable rates, with a commitment to environmental enhancement and a healthy California economy. We regulate utility services, stimulate innovation, and promote competitive markets, where possible, in the communications, energy, transportation, and water industries"
Seems like the public interest wasn't served very well, if at all. When scheduled (and paid for) maintenance and safety work isn't performed, one has to question whether the state PUC is doing its oversight job effectively. 63 percent is a huge rate increase. Huge. Did you pay go up 63 percent? Mine didn't, and I doubt that yours did either. Did your electricity consumption go up 63 percent? Mine didn't, and I doubt that yours did either. The "public good" is a balance between the needs of ratepayers and the utility providers. Things seem lopsided. Besides the negative impact upon the Boston and metro-area economy, the huge electric rate increase is especially difficult for retirees on fixed incomes. State politicians, the Boston Mayor's office, and the Massachusetts PUC need to explain how they let this huge increase happen. What are your opinions of the above events in California? Massachusetts residents: what do you think about the recent rate increases in your electric bills? "... Just Energy, through a third-party telemarketing vendor and door-to-door agents, engaged in deceptive marketing and sales that misled consumers into signing contracts based on attractive introductory pricing, only to later increase their electricity supply costs." This blog first reported about Just Energy in 2010. After that blog post, consumers in the United States and Canada summited comments, followed by sales and sales management representatives of the electricity supplier. I did not see any mention of the settlement agreement in the Just Energy website. Based in Mississauga, Ontario (Canada0, the company lists a local office for Massachusetts residents in Buffalo, New York. Affiliated companies include Amigo Energy, Commerce Energy, Hudson Energy, and Tara Energy. "... ust Energy sales representatives allegedly failed to disclose complete and accurate pricing information to its customers by promising savings or representing that they could help consumers keep their electricity bills low. Instead, consumers were charged rates that were higher than the rates for the electricity supply provided by NSTAR and National Grid. Just Energy also allegedly induced elderly and non-native English speaking consumers by continuing to offer electricity supply services even after it became clear that they did not understand the terms of the proposed contract." Consumers were allegedly switched from their distribution company to Just Energy without their authorization... The AG’s Office alleges that Just Energy made false representations concerning its electricity products, including that its products would provide “green” or “renewable” energy at prices comparable to basic service, and that its products were offered as part of a state-run program..."
I congratulate the Attorney General's Office for protecting consumers and enforcing the laws. "The email exchange from October 2011, obtained through an open-records request, offers a hint of the unprecedented, secretive alliance that Mr. Pruitt and other Republican attorneys general have formed with some of the nation’s top energy producers to push back against the Obama regulatory agenda, an investigation by The New York Times has found." "The letter to the Environmental Protection Agency from Attorney General Scott Pruitt of Oklahoma carried a blunt accusation: Federal regulators were grossly overestimating the amount of air pollution caused by energy companies drilling new natural gas wells in his state. But Mr. Pruitt left out one critical point. The three-page letter was written by lawyers for Devon Energy, one of Oklahoma’s biggest oil and gas companies, and was delivered to him by Devon’s chief of lobbying." "Industries that [Mr. Pruitt] regulates have also joined him as plaintiffs in court challenges, a departure from the usual role of the state attorney general, who traditionally sues companies to force compliance with state law." According to the newspaper's report, the Southern Company of Gergia, an electric utility, also sent similar letters to states' attorney generals. The goal seems to be to roll back regulations that currently ensure clean air, water, and land -- a spun in terms of advancing states' right and limiting federal government rights. This may be happening in 15 other states; most with Republican attorney generals.One set of documents describe a former state attorney general who became a lobbyist. In the course of representing a client a lawyer shall not knowingly: (a) make a false statement of material fact or law to a third person; or (b) fail to disclose a material fact to a third person when disclosure is necessary to avoid assisting a criminal or fraudulent act by a client, unless disclosure is prohibited by Rule 1.6." A lawyer representing a client before a legislative body or administrative agency in a nonadjudicative proceeding shall disclose that the appearance is in a representative capacity and shall conform to the provisions of Rules 3.3 (a) through (c), 3.4 (a) through (c), and 3.5. Comment:  In representation before bodies such as legislatures, municipal councils, and executive and administrative agencies acting in a rule-making or policy-making capacity, lawyers present facts, formulate issues and advance argument in the matters under consideration. The decision-making body, like a court, should be able to rely on the integrity of the submissions made to it. A lawyer appearing before such a body must deal with the it honestly and in conformity with applicable rules of procedure..."
What are your opinions of Mr. Pruitt's alleged actions? Of the secret alliance? Any readers in Oklahoma care to comment below? I expect these actions from elected politicians, not lawyers responsible for enforcing the state's laws. These alleged actions put a democracy in peril. Many consumers now have smart meters installed in their homes. Now, both public utilities and private sector companies provide consumers with energy services. Some people are concerned about the privacy implications with the new technologies. So, I have added a new topic in the tag cloud in the near right column. The "Energy Providers" topic includes content where we will explore these and other issues. I hope that you like the new category. Earlier this month, Rhode Island residents were warned about a utility scam where fraudsters try to trick them into disclosing sensitive bank account information. The fraudsters pretend to be representatives from your local utility provider; in Rhode Island, National Grid. During the phone call, the fraudsters claim that customer's account is past due, and that their electric or gas utilities will be shut off unless they pay immediately, by providing their bank account and payment information over the phone. Besides Rhode Island, the fraudsters have targeted consumers in Pennsylvania, Maryland, Ohio, Florida, and Alabama. In Florida, the fraudsters demanded payment via the Green Dot prepaid card. Contact directly your utility provider directly about your account status.